That quote gets to the heart of the new space to provide free training, expertise and more for startup entrepreneurs. It’s also key to the initiative that spawned Happy Valley LaunchBox, Invent Penn State. LaunchBox is a signature program of Invent Penn State, a statewide initiative introduced by university President Eric Barron to spur economic development while helping students succeed professionally through collaboration between Penn State and local communities on entrepreneurship-focused programs. 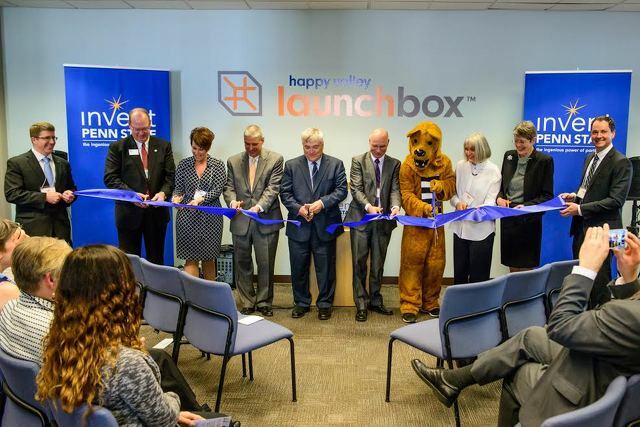 Happy Valley LaunchBox is one of eight Penn State-led entrepreneurship spaces around the state, with the creation of six more to be announced soon. “This is Penn State, at all of its campuses, working with its communities in partnership to promote entrepreneurial thinking, to create ideas that have impacts on communities and to create companies that help support economic development, job growth and student career success,” Barron said. The new space on Allen Street provides selected companies a 10-week business startup program and up to nine months of work space, along with professional consulting and mentorship from area entrepreneurs, Penn State faculty and alumni. Happy Valley LaunchBox also offers walk-in information desk service during weekday business hours for startup resources both inside Penn State and in the local community. In January, the first five business startups began working in Happy Valley LaunchBox. Teams complete 10 weeks of business startup training, have access to no-cost legal and marketing consulting and enjoy free co-working space that’s available 24-hours daily for up to nine months. Applications recently wrapped up for the second LaunchBox cohort. At full capacity it can host up to 30 startups per year. One of those currently working in the LaunchBox is Project Vive, which created a device that assists people with communication disabilities. It was co-founded by Penn State student Mary Elizabeth McCulloch, now a senior majoring in biomedical engineering. McCulloch has been helped by the university and local entrepreneurial community since she envisioned the idea as a sophomore. The Pennsylvania Technical Assistance Program brought her project to the attention of Penn State’s Small Business Development Center. They connected her team with the New Leaf Initiative, a community innovation hub housed across the street from and an inspiration for Happy Valley LaunchBox. Lion LaunchPad, a student entrepreneurship accelerator helped her get funding. McCulloch was then accepted last summer into Penn State’s Summer Founder’s program which gives students $10,000 to work on their startups. McCulloch is an ideal of what Barron envisioned with Invent Penn State and projects like LaunchBox. And the community seems to be on board. The LaunchBox location is not by accident or a mere matter of available space. It is close to the heart of downtown State College, and across the street from the State College Borough Building, which happens to house New Leaf. “LaunchBox is important to the diversity of our own downtown, in helping to create a climate for young professionals with talent that includes housing, restaurants, entertainment and more,” State College Mayor Elizabeth Goreham said. The local business community is committed to the effort as well. Last year the Chamber of Business and Industry of Centre County (CBICC) signed a memorandum of agreement with Penn State to formalize their economic development partnership. On Thursday, CBICC President Verne Squier said it’s up to local business and government to help entrepreneurs succeed once they leave the LaunchBox as well. “We have to be willing to accommodate and encourage and provide an environment where these enterprises can thrive -- not just exist, but thrive,” Squier said. The involvement of so many people -- both the new entrepreneurs and the community helping them to succeed -- is what gives the project much potential. “One of the most valuable assets Happy Valley LaunchBox offers startups is access to the plethora of Penn State faculty and area entrepreneurs who provide mentorship,” Sharkey said. The effort is being noticed, not only in State College. Squier said he’s spoken to leaders in other university communities who are watching initiatives like LaunchBox and seeking ways to emulate them. Sheri Collins, Pennsylvania’s deputy director of economic and community development, said the enthusiasm and success of Penn State entrepreneurship initiatives is being seen in Harrisburg and points far beyond. With the new season officially underway, the slate of spring sports are finally gaining attention on campus. 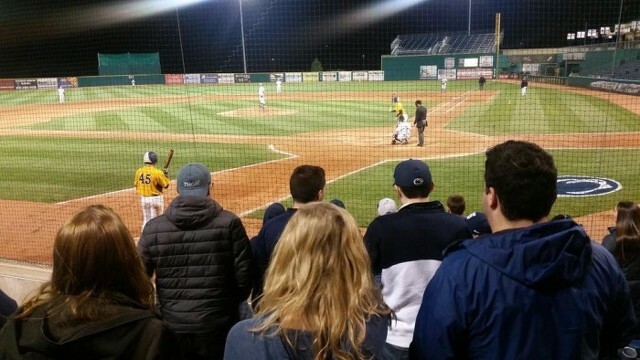 For fans of the Diamond Lions, much of this attention stems from their student section, affectionately known as Cooper’s Town, and how the organization is beginning this baseball season with a new and improved hustle.